The cult favourite — finally available in Australia! Smith’s Rosebud Salve has been loved by many since its humble beginnings back in 1895. The business began when families asked Dr George F. Smith to create a salve for soothing minor skin irritations. Dr Smith formulated a product that he originally called 'Balsam of Rosebuds', a name that paid homage to the sweetly scented rose oils that the local women loved to wear. Soon, the popularity of Smith’s Rosebud Salve grew to the point where Dr Smith began to advertise his product in the local tabloids. Within a few years, Dr Smith was managing one of the most unusual mail-order businesses and selling four brands door-to-door through his sales agents. Fast-forward to the present day, and Rosebud products are more popular than ever, with the company being owned and run by Smith's descendants. Smith’s Rosebud products are available in a variety of different formulas. Both the classic salve and the lip balms are available in signature tins and convenient 0.5-oz. tubes. Soften your lips with the sweet berry flavour of Brambleberry Rose or choose Mocha Rose with Vanilla for a pleasant mocha taste. These balms contain fragrant essential oils and botanicals to help keep lips soft and protected. The signature salve also comes in a variety of formulas. I suffer from dry lips and and tend to use medical ones when they are really severe. 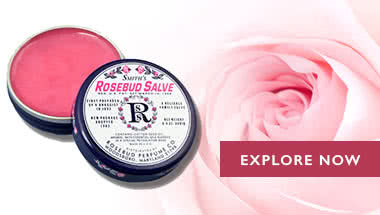 But when I feel like my lips need a treat I use Smith’s Rosebud salve for the tint and feel. I absolutely love how it feels on my lips, and you will too! This lip balm feels nice to apply on the lips and it's not sticky at all. It has a slight pale pink tint and has a cooling sensation on the lips due to the mint, which I really like. This is a big tin that will last for ages. it is an alright lip balm. the vaseline rose lip balm in the tin does the exact same thing. Smells good.